Today is second day of Diwali, actually first day after the Amavasya (black night-Dark night- no moon). Moon of first day will be there in sky today night. Usual 14 day Lunar cycle. How long it has been so in existent in our country? no body knows? A mystery for many. Whether Aryabhatt, Bhaskaracharya, Bhaskar-I, Brahmagupta, Or Rishi Katyayan or anyone much more earlier times has invented the 14 days cycle of moon? I am blank since i don’t know much of SANSKRIT. So how do I cross check? or how i do the research? where to refer to? which library has such collection so that i can know exact date when someone from this part of EARTH has invented the Lunar cycle? So called new scientist Mathematician of today’s time laugh at this idea of searching the source where it all started? Who was he? If some one says that he was a Jyotishi or Acharya? they laugh that such thing do not exist. What is Acharya? we know only the word Scientist!!. I am loosing my path…. leave it…..But I am in pain due to inability to read SANSKRIT. All the treasure of knowledge is lying buried in Sanskrit. When and who will unearth whole of that treasure, which was BURNT in Taxilla or Nalanda (since i read in History books)? so that every one can know the truth. Everyone means anyone who lives on this planet Earth. Since Vedic times idea in India has been to pray fro everyone not just ME or I. No mantra says or asks god that give me this or that. Read the above, it is a prayer for all. thus this land called India is a great land, pious land or the paawan bhoomi. Many great thoughts originated in this land. Whatever i have read in NCERT books from 1974 to 2000 in Kendriya Vidyalaya (Central school) and in later life, based on it I can tell the story behind Govardhan. Govardhan was a Mountain near Mathura/ gokul area. Jamuna flew nearby. That was a Agrarian society(if i may say so). Thus importance of Agriculture and livestock could be understood very well. As to why these were important for a society to sustain itself. Mountain Govardhan represents the Nature. The Cow represents the Society or so to say the key factor of economy. Thus to understand the story we have to see in the light of these aspect of society. In earlier times (prior to Krishna) people offered pooja to Indra, Varun and Agni dev. Indra was rain god and kings of gods, Varun was water god, Agni means fire god. When Krishna saw all this, he asked the villagers: why you give offerings to Indra? You all do not know who is the actual provider, We should worship the Mountain Govardhan, it is due to him that we get rain!! and when rain comes we get grains/fodder, food for people and Go Vansh(Cow/livestock) gives or support us with milk and alternate livelihood. Thus if we worship and take care of Govardhan, we will prosper. After so much of debate and argument, heated exchanges of words, (there might have been other disorderly behavior also, i can imagine). Few people might have been got convinced by Krishna and they did not worship Indra and started worshiping Govardhan. Due to this Indra felt Offended, he ordered Rains, winds, storms etc over the village. There was hue and cry everywhere in the village, Heavy rains, flood etc forced villagers to catch hold of Krishna. Krishna then took the mountain, lifted it on little fingure? ?, actually imagery depicts Krishna lifting the mountain!! It is said that He lifted the mountain Govardhan and thus he is known as Govardhan Dhari or Giridhar (Giri-mountain, dhar means one who adorns). 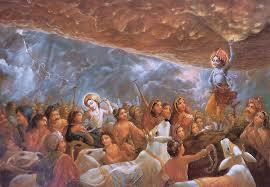 He with the help of Govardhan mountain saved the villagers and Go vansh(cow herds/livestock) from storm. From then on worhsip of Govardhan started instead of Indra. Indra due to his failure asked for forgiveness from LORD Krishna. It is also signifies that Overconfidence or Self proudness etc should not be there in a true being. Krishna shattered the PROUD of Indra. Somewhere i have also read that Indra was lord of dams and he was also the lord of rivers. Krishna by this act teaches people to worship the Prakriti, Mother Nature, or to look nature as our mother, He stressed the need to think about nature, which gives us everything. We should not destroy all natural things/nature, or exploit the nature-Prakriti. we should not pollute nature. Today someone said, we always remember god but we do not remember what Krishna has said… therefore we should follow what he said rather than we only keep remembering Krishna-His name?? only. Govardhan pooja reminds us the need of Nature in our life. It tells how Nature is important in our life. On this day Gobar is used to make Govardhan, cows and its family, the gopals, people often made the plough, ox, calf, trees etc. All this is made out of Gobar(cow dung). later these symbols are Worshiped. food grains are offered. Later these are donated among poor. Also consumed as prasad. First of all bathing of cow is done. Cows are decorated with colors and flowers. Fruits and food is given to cows and then worshiped. After that some of the earth from below the hoofs of cow is picked up and kept in home. whenever someone goes out for new job or new work a Tilak of this piece of clay is put on forehead. That brings success. Such was the devotion. I mean in those times Cow used to have high status in the village economy. Thus these parvs- festivals always remind us lots of things. But due to our negligence-ignorance we do not know actual need of such kind of festivals. On this Govardhan pooja day, food is cooked on a single fireplace in a home. If there are four five kitchen in a family house, and nowadays we do have such houses where brothers live in same house complex but food is cooked separately. But today on govardhan pooja only one fireplace is used. What that signifies? it is to bring together all our loved ones at one place. It is about growing the BONDs among the families, then in our village. All perform pooja similarly in village openly, thus a feeling of togetherness is induced, sublimely.(inspiration-inspiring). I do not know whether any scientist did try to research whether cow is the original animal or the buffalo?? or it can be phrased in other way. Is there any archaeological evidence that buffalo was inhabiting India prior to cow? Did any scientist try to establish scientifically, what people are saying about cow is wrong? I mean there is fashion nowadays that if anyone says something of our rich past then other people start criticizing it, without evaluating. Thus now it is time that we should start learning Sanskrit and give it proper place in our mindset. Without that i don’t think we can revive our great things which have been lost. Either in Taxila, Burning of Nalanda? or in later times whatever was amassed away by the British East India company. Sanskrit is the key. Or institutes/organisation having the Sanskrit manuscript should make an ONLINE library of such texts. just like DIGITAL INDIA, whereby we can know our rich past heritage. Now a days, we are afraid that if we talk about our rich past heritage then we are blamed as communal. It is reverse, we have to protect our rich past heritage from pseudo secularism. Thus we have to start from our home. Start learning Sanskrit. Start celebrating all the parv, festivals, which always teach us to worship mother nature. We can save our earth only by following the teachings of Krishna, Ram, Budha, Mahavir, Guru Nanak, etc. we are so tolerant that at this age or in this century we also follow Kabir? Raidas, Ramdas, Basavana, Eknath, together with Adi Sankaracharya, Vivekananda. But we have somehow lost Charak, Patanjali, Sushrut samhita, Ayurveda, Natyashastra, etc. No longer in the mental space of common man.